Posted May 3, 2018 by Sage & filed under Teaching, Yoga. 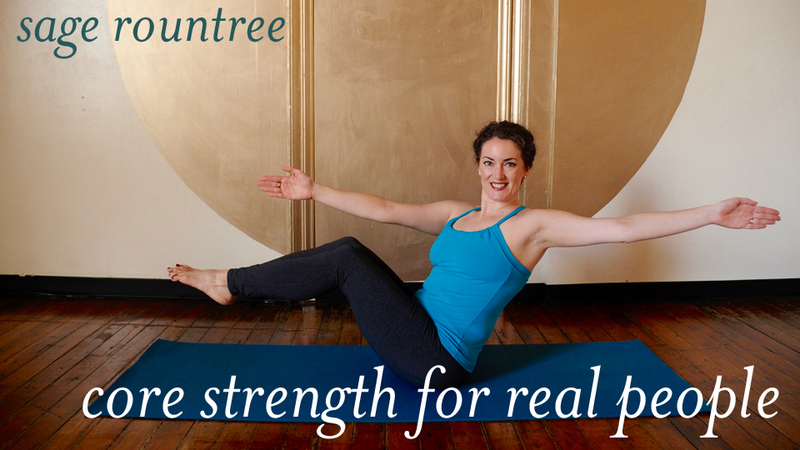 We have a great crew already committed to the Core Strength for Real People workshop at Carrboro Yoga, Saturday and Sunday, May 19–20. If you’ve been on the fence, sign up now before we hit our maximum! And if you can’t make it in person, you can follow along with fun, doable core videos anytime at corestrength.sagerountree.com. WHEN: SATURDAY AND SUNDAY, MAY 19 AND 20, 10:00 A.M.–5:00 P.M.
Saturday’s sessions are open to everyone and can be done à la carte; Sunday’s sessions are for movement teachers from any background, and build on what we’ll learn Saturday. Yoga Alliance–registered teachers will earn 12 continuing education hours, and the course fulfills an elective requirement for the Carolina Yoga Company 500-Hour Advanced Studies Yoga Teacher Training. Saturday Morning, 10:00 a.m.–1:00 p.m. In this session, open to students and teachers alike, we explore the fundamentals of the anatomy and kinesiology of the core, and the physiology of adaptation to exercise. Don’t worry—it’s not dry! Once you wrap your brain around the simple principles we’ll learn in this session, you’ll be able to devise your own core routines to keep you strong and balanced over the years. We’ll finish the morning session with a full Core Strength for Real People class to integrate what we’ve learned. In this session, open to students and teachers alike, we apply the morning session’s theory as we explore segments of core routines to keep you strong and balanced over the years. (You are also welcome to join for this session only.) All along the way, we’ll try the moves and talk about how to do them safely, why to do them, what they work on, and when to include them in practice. We’ll finish the afternoon session with a friendly restorative practice to jump-start your recovery from the day’s work. Sunday, 10:00 a.m.–1:00 p.m. and 2:00–5:00 p.m. In this full-day session for movement teachers from any tradition, we examine the pedagogy of teaching core work to students in a group. We’ll explore ways to make sequences easier and more challenging while still being inclusive of everyone present. Using our understanding of physiology from Saturday morning’s session, we’ll determine when and how to stretch and rest in the context of a full class. We’ll finish the morning session with a full Core Strength for Real People class, then break for lunch from 1:00 to 2:00 p.m.
After lunch, we’ll practice putting together a full core class. You’ll devise, workshop, and revise a segment from a class, then plan a full class sequence that complements what you’ve taught. You’ll learn how to replicate this to create your own sequences and classes using the principles we’ll work with all weekend, and, after a sweet recovery practice at the day’s end, you’ll leave ready and excited to teach fun, accessible core-strength classes to groups of every level. If you’re traveling, find some accommodation and travel tips at the Carolina Yoga Company Travel Accommodation page.